It’s been raining again, something I’ve been saying a lot this year! For November in the southern hemisphere however, this can sometimes be more of a curse than a blessing. Root crops can be susceptible to fungal diseases and I’ve seen potatoes rot in the ground from too much water. I noticed last weekend that a few of my garlic plants (the ones I could see through the weeds that keep coming back!) were sending up flower buds so this morning I took the time to check near the edge of the bed. Usually, this involves removing the mulch and then gently (and patiently) scraping the soil away from the stem until I can see the shoulder or top of the bulb. But today the soil was so soft and damp it was very easy – a little bit too easy really! At this stage of the year, my garlic is usually just starting to swell and hasn’t as a rule formed a head yet. Imagine my surprise when I pulled this monster out of the ground! There was a little bit of mould on the outer layer but with careful curing I think the crop should be fine. Last year I lifted my main crop in mid November but I think I’m going to be looking seriously at getting most of it out of the ground this coming weekend. 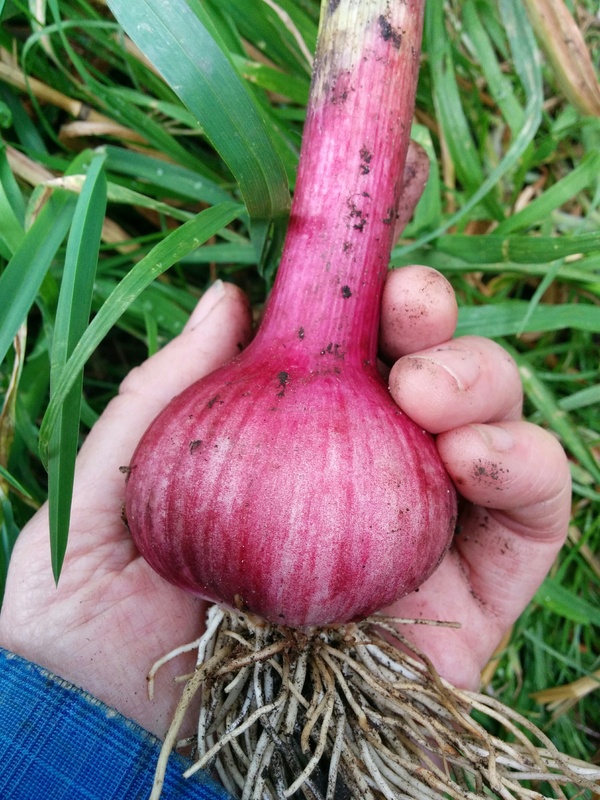 Knowing when to harvest garlic is another one of those arcane arts, and there’s a lot of disagreement about it. Some people wait until the leaves are turning brown, but I find the heads have often separated and don’t store as well if I leave them in the ground that long. Usually, I look for any where flower heads (also called scapes) are forming and if the lower leaves are starting to die back, all the better! 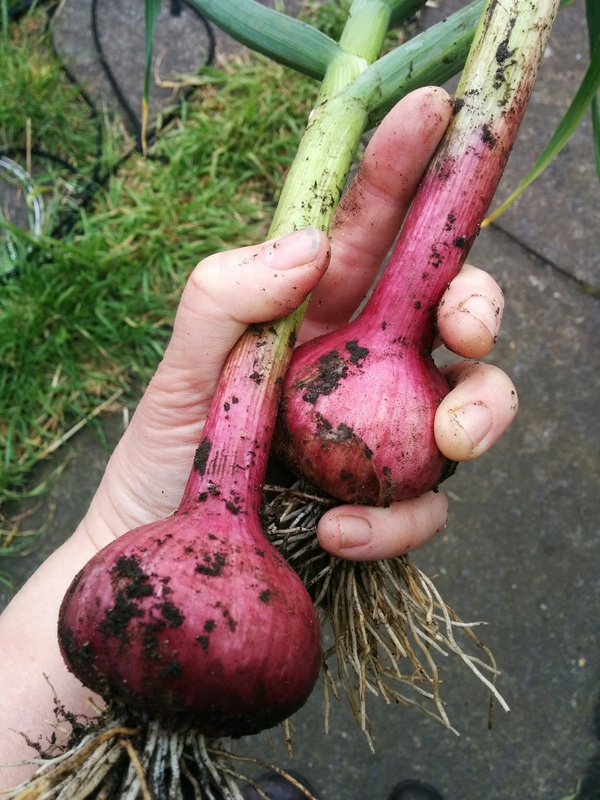 For the sake of being logical and making a comparison, I checked another garlic plant further in the bed – and pulled out another fully formed monster. Do note, my hands are quite small but these heads are really big! Ultimately, no one knows your garden better than you, all its microclimates and idiosynchrasies. What works for one gardener might not work for another. You have to make your own decision about when to harvest and be prepared to get it wrong sometimes, as I have some years. The key is to learn from it and not give up!